Embark on a grand tour Neuhaus’s impressive imported Belgian chocolate creations! 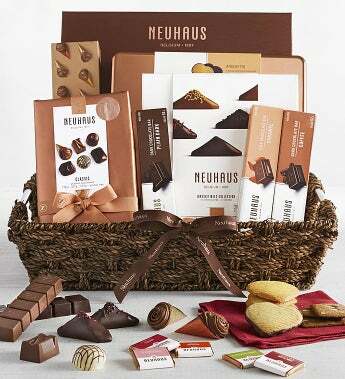 This Simply Chocolate Exclusive collection from Neuhaus is the next best thing to a holiday in Brussels. Enjoy a decadent selection of the finest Belgian chocolate from the inventor of the chocolate praline. Featuring a full-sized box of hand-crafted Irresistibles, Biscuit Assortment in 4 flavors, ½ lb. classic ballotin box in milk, dark and white chocolate, 40 pc Belgian chocolate square Carres in 10 flavors, famed Cornet Pralines and three specialty chocolate bars. Amandagio: This almond biscuit is made according to a traditional recipe using fresh butter and almonds. A thin, unbelievably crunchy biscuit. Amouretto: This butter cookie covered with dark chocolate is made according to a traditional recipe. In a romantic heart shape, it combines the delicate flavor of fresh butter with the intense flavor of dark chocolate and a deliciously crunchy texture. Allegro: This butter cookie is made according to a traditional recipe. In a pretty heart shape, it combines the delicate flavor of fresh butter with a crunchy texture. Diavola: This almond cookie covered in dark chocolate is made according to a traditional recipe using fresh butter and almonds. A thin, unbelievably crunchy cookie, covered in intense dark chocolate. Total Net Wt 2 lbs. 4 oz.